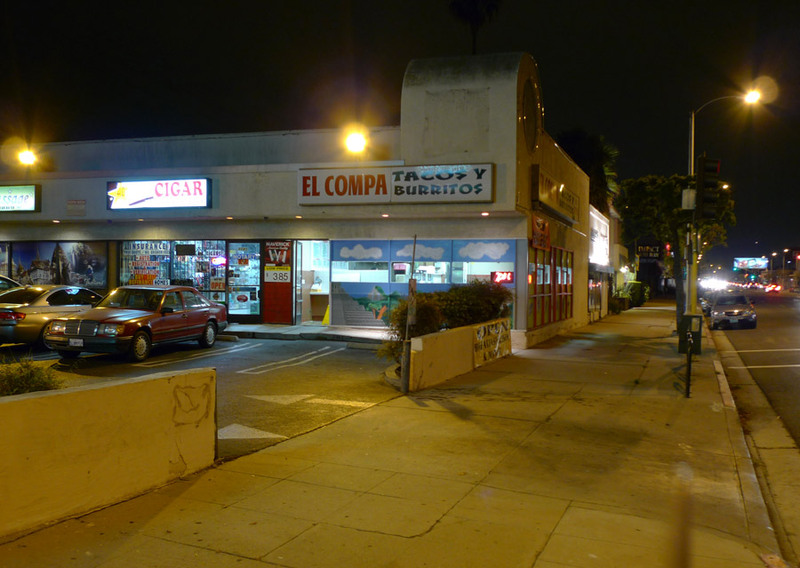 El Compa feels instantly familiar, probably because it used to be a Campos, according to interweb folklore on Yelp. Carmen and I ended up here this evening in our search for a nearby quick taco meal. As the Yelp! reviewers observed, El Compa is in a tiny strip mall possessed of a “shady” and/or “seedy” character by virtue of the discount Thai Massage joint and the crowds of people loitering outside; but El Compa itself is not shady, it’s the platonic, and platonically forgettable, neighborhood taco shop. We drove past the corner of La Brea and Venice on the way, the corner of the famed Tacos Leo, where until recently the best al pastor tacos I’ve ever had were served directly from the trompo in a gas station parking lot. A couple of weeks ago the LA Weekly’s “Squid Ink” food blog published an article about Leo’s, and (coincidentally?) the fuzz came and shut down the article and confiscated the trompo. Tasting Table’s account of the story. Fingers were pointed at the Weekly’s blogger – had the mainstream attention to the humble taco truck scene in a disused Unocal station brought on persecution? 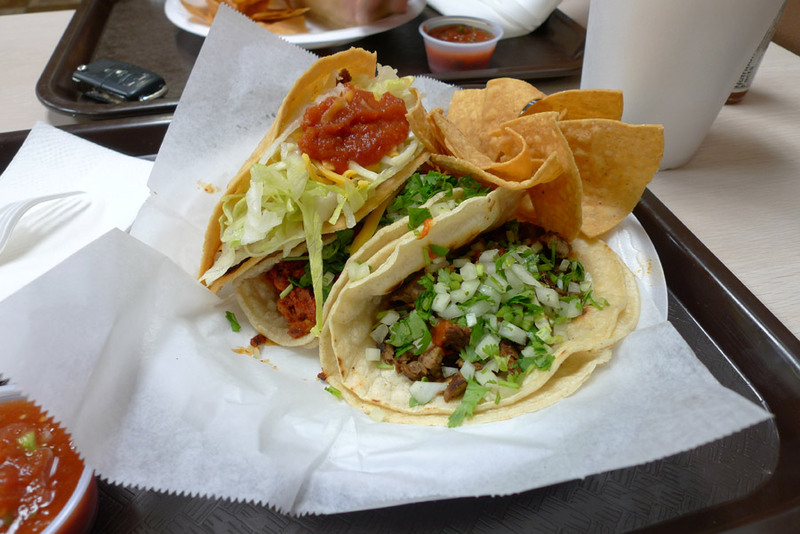 Is taco blogging in fact a form of gentrification, an inadvertent means of helping white douchebags and hipsters take over and deplete the authenticity of undiscovered institutions? There are some methods you can use to avoid being a gentrifier. You can choose to live in places that are already middle-class or mixed-race in character, for example, or choose neighborhoods inherently gentrification-resistant by virtue of their character. You can write about taco shops that are in no danger of having their authenticity corrupted by hordes of hipsters. Like El Compa, which fed me a mediocre but satisfying meal, three tacos and a good horchata. The inside still looks like a Campos, with a Campos menu board and Campos menu items. The acoustic panel ceiling is painted out to look like a beautiful cloudy sky. The dining room is humble, pleasant enough. I ordered three tacos, one each of the al pastor, carne asada, and a hard shell taco with ground beef. El Compa looks like the kind of old-school place where the crispy tacos are an important part of the menu, and this fact must be respected. The soft tacos were $1.35 each and the hard taco $1.95, if I recall correctly. I ate the hard shell taco first, which was probably correct, as I received therefore maximum sensation of its hot, oily, fresh-from-the-fryer crispiness. The meat was sludgy like at Jack in the Box. The tomato sauce-like salsa combined with the shredded cheese reminded me of pizza, which is not a bad thing. A tasty crispy taco. The soft tacos were okay. I ate the carne asada taco next. The tortillas were leathery and resilient, not laminated, bigger than average (as were the tacos), a bit dry, but that’s better than soggy or failing. The steak, finely diced and, well, steak-flavored, at first made a good impression. It was thoroughly seasoned with carne asada seasoning. But by the time I was halfway through, all I could discern was that it was too salty. I was empalagated. It would work better in a burrito, tempered with a bunch of other stuff. The onions were diced to a pleasing fineness, the cilantro appropriate, but the red salsa (served on the side in a plastic cup) disappointed – too much tomato, no spiciness. I resorted to the Tapatio. The al pastor tasted like the al pastor they used to serve at the Campos that was on Venice Boulevard and is now a Pancho’s. Sweet, bright red, rather saucy. Good enough to eat, and would be even more enjoyable had my standards not been raised by the stimulating and superior al pastors I’ve been exposed to this year. At an old school place like El Compa, you will do well to order the hard shell taco, and savor the knowledge that you are not acting as a shock-trooper of gentrification.